While in Vietnam his unit provided artillery support to the Marine infantry units who were engaged in the June 1967 battle of Khe Sanh. 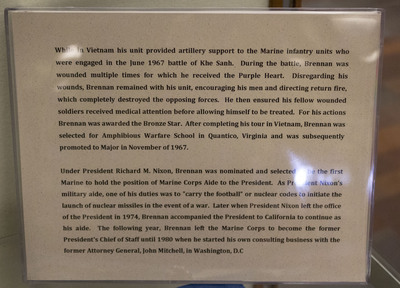 During the battle, Brennan was wounded multiple times for which he received the Purple Heart. Disregarding his wounds, Brennan remained with his unit, encouraging his men and directing return fire, which completely destroyed the opposing forces. He then ensured his fellow wounded soldiers received medical attention before allowing himself to be treated. For his actions Brennan was awarded the Bronze Star. After completing his tour in Vietnam, Brennan was selected for Amphibious Warfare School in Quantico, Virginia and was subsequently promoted to Major in November of 1967.